Henry Baker's parents were Sarah Ann Britham and Henry Baker. His father, also called Henry, was a domestic butler. He attended a number of small schools in Cambridge before being educated at Perse School in Cambridge. He won a sizarship to St John's College in the summer of 1883 but remained at Perse School to prepare for the Cambridge Scholarship examinations, which he sat in December 1883. In the examinations he won a scholarship to St John's College, Cambridge, matriculating in October 1884. 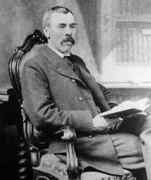 In 1887 he was Senior Wrangler in the Mathematical Tripos. In fact he was first equal, being bracketed in top place with two other students. He was elected a Fellow of St John's College in 1889 and, in the same year, won the first Smith's prize. Baker would remain at Cambridge for the whole of his career, strongly influencing the teaching of pure mathematics in that university and in the rest of Great Britain. From 1890 to 1895 he was a College Lecturer, being influenced by Cayley during this period, then he became a University Lecturer until 1914. From 1903 to 1914 he also held the Cayley Lectureship in Mathematics, then from 1914 until he retired in 1936 he was Lowndean Professor of Astronomy and Geometry. He justified the 'astronomy' title in his chair by lecturing on periodic orbits and other astronomical topics but he continued to undertake research exclusively in pure mathematics. Baker, while on a visit to Göttingen, was inspired by Klein to study algebraic function theory. He wrote the important Abel's Theorem and the Allied Theory of Theta Functions in 1897 and another major contribution Multiply Periodic Functions in 1907. The first of these was reprinted by Cambridge University Press in 1995. He also came in contact with the Italian School of geometry and made their work the subject of his 1911 London Mathematical Society presidential address. From 1911 he studied birational geometry publishing his most important contribution, a six volume masterpiece Principles of Geometry from 1922 to 1925. The first two volumes cover the foundations of Euclidean geometry and the introduction of a coordinate system, volume 3 studies solid geometry considering quadrics, cubic curves in space, and cubic surfaces. Volume 4 considers higher dimensions, mainly dimensions four and five, while the final two volumes cover the analytical principles of the theory of curves and the theory of algebraic surfaces and higher loci. In 1943 Baker published An Introduction to Plane Geometry which was reprinted in 1971. Its contents are as follows: Euclid's theory of parallel lines; Propositions of incidence; The symbolic representation and Pappus's theorem; Theorems proved from the propositions of incidence; The fundamental hypothesis; The symbols of the real points of a line; Involution and harmonic ranges; Related ranges and pencils; Conics; Assignment of two absolute points, properties of circles; The parabola; The rectangular hyperbola; Theorems on conics; Length and distance; Equation of conic and line. Baker also undertook the extremely large task of editing Sylvester's papers. The four volumes of the Collected Mathematical Papers of James Joseph Sylvester were edited and published by Baker between 1904 and 1912, and with these volumes he produced a fitting tribute to the great mathematician. The mathematician is as sensitive as others to the marvel of each recurring springtime. ... Pure mathematics is an art, a creative art. ... Pure mathematics is not the rival, even less is it the handmaid, of other branches of science. Properly pursued it is the essence and soul of them all. In appearance Baker was a heavily built man, with a thick moustache. this made him rather formidable to strangers and as he was also very shy some found him difficult to approach at first. But once the barriers were broken down his pupils found him less awe-inspiring, although they always treated him with great respect. The protocol at his "tea-parties" was strict, and a pupil could not stay away without an acceptable excuse; but provided the rules were obeyed the atmosphere was extremely friendly.